With demolition done and all the finish material delivered, Week Two started with the first actual construction work on the shower. 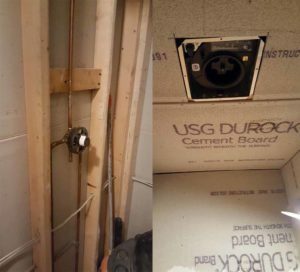 First up was replacing the old shower valves, and the old wet/dry fan/light, followed by the installation of the cement wallboard. Cement Board is a much better base for tile work than drywall “greenboard”, and essential for a shower. Cement board doesn’t absorb water at all, and because it’s so rigid, it keeps the tiles solidly in place. 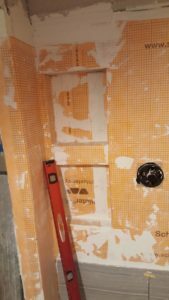 That’s the first step in making the shower waterproof, the next step is applying a waterproofing and vapor barrier membrane over the shower about two-thirds of the way up from the floor. That’s the orange stuff in the photos, it’s basically a special plastic sheeting placed over thinset mortar. You can see where George has lapped it over the two shampoo niches we built into the shower (replacing the porcelain shelves we’d installed 23 years ago!). We ran into a minor problem here. We wanted one niche next to each showerhead, but right next to Karen’s showerhead was the heating duct for the bathroom, which we didn’t want to move. So both niches ended up on my side of the shower. At the bottom of the photo is the wall tile already started! I neglected to get a photo, unfortunately, of what happened just before this, the installation of the shower pan. The shower pan is made of a loose, dry concrete mixture that George shaped to slope gently to the drain in the center of the floor. You don’t need a steep slope, just enough to get the water moving. Once the concrete cured, George installed the mosaic tile flooring over a mortar base. Now the wall tile goes up, bottom to top. Plastic spacers are used to keep all the joints equally sized, and to keep the tiles a consistent distance from the backer board. That helps make sure there’s the right thickness of mortar behind the tile, helps align the mortar joints with each other, and keeps the tiles in the same plane. The alignment of the joints turned out to be one of our favorite things about the work George did – he paid extraordinary attention to the size of each tile and how the joints aligned with each other. He recut some tiles several times until they were just right. The result is near-perfection, and another reason why this wasn’t a DIY job for us! It was also the longest phase of the job, taking almost two weeks from the time the first tile went up to the final grouting of the shower and tub deck. The back of both shampoo niches is the same mosaic tile as the floor. George did a great job with the tile “frames” around the niches. 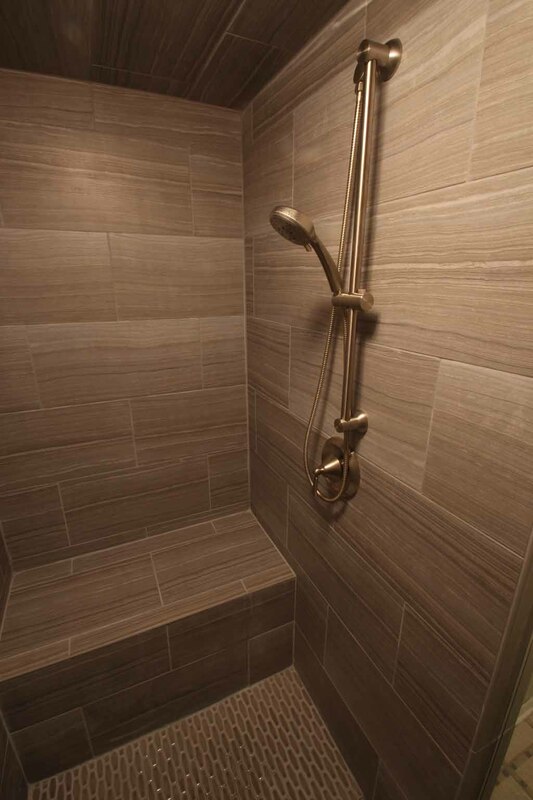 When we picked out the finishes for this shower, we were after a sort of a “spa” look – I think we got it exactly what we were after! That left just three items to finish up – a new shower door, paint, and flooring. 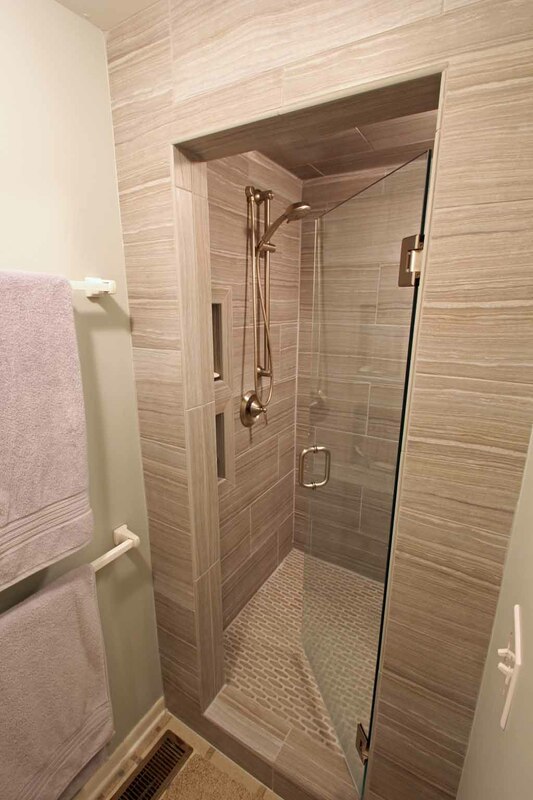 We worked with Eastway Supply for the door, which is 3/8″ clear glass, frameless, with hardware that is a very close match to the polished nickel of the showerheads. 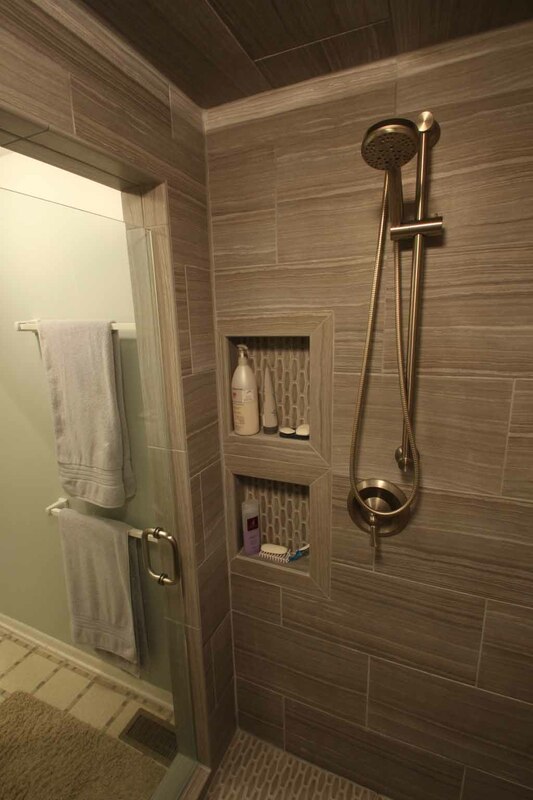 Shower doors are custom made, which means they can’t be measured for until the tile work is done. It’s two to three weeks from measuring to installation, so we used a shower curtain on a cheap curtain rod in the meantime! Total installed cost of the shower door was $825. Karen and I handled the painting. Our bath is partially open to the bedroom (part of our 1993 addition project) and so we decided the walls in the bath should be the same color as the bedroom, Sherwin-Williams “Silver Strand”. We’ve done a LOT of painting over the years, so knocking that out in a weekend was easy. The old sheet vinyl flooring is still in place, even though we have all the wood stacked up against the bedroom room wall, ready for installation. The shower wrapped up in mid-November, so we decided to take a break until after the holidays. But we’ll show you how that goes in a later post! After everything was done, we had some tile left over. Floor & Decor allows returns, even open boxes and leftover bags of grout (George only needed two of the three). We returned a little of each type of tile, one bag of grout, and credited $60.63, lowering the total to $10,032.72. Next is the flooring, then eventually, new countertops. We look forward to sharing it all with you!